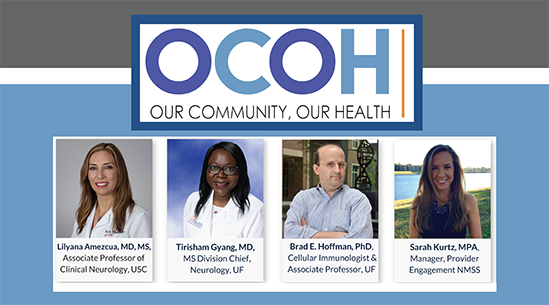 On September 27th UF HealthStreet hosted a town hall meeting on the advances in care and treatment of Multiple Sclerosis (MS), an autoimmune disease which affects an estimated 2.3 million people worldwide. Sarah Kurtz, MPA, manager of healthcare-provider engagement at the National Multiple Sclerosis Society. The moderator was Tirisham Gyang, MD, assistant clinical professor, and division chief for MS at the University of Florida’s department of neurology. Brad Hoffman, Ph.D. said the simplest way to understand how MS affects the body is to visualize earbuds with their protective rubber coating covering the copper wires; this coating keeps them from shorting-out when the wires touch, which would interrupt the listening experience. Lilyana Amezcua, MD explained that there are some populations around the world that are less likely to be affected by MS and when someone from one of these populations does get MS it is unknown if the disease will behave differently. This is one reason why having diversity among research participants is important, to determine whether modifying a therapy when seeing a patient from one of these populations would be beneficial. To illustrate her point Amezcua said that throughout Latin-America, MS is less often a condition but in the Hispanic-American population, those who are diagnosed with MS are diagnosed at a younger age of onset. She also pointed out that in a recent literature review less than 1 percent of all populations have been studied. Gyang said that this is a very exciting time because we have several resources to help battle MS, as opposed to 30 years ago when a diagnosis meant there was not much that could be done. She explained how current therapies and potential new treatments progress from pre-clinical discoveries to FDA-approved medicines and highlighted the following list of therapies that are commonly used for MS.
Gyang also echoed the need for diversity among research participants. “We need representation from different groups during these research studies because if a drug worked very well in one population, can we infer that it its going to work the same on everyone? 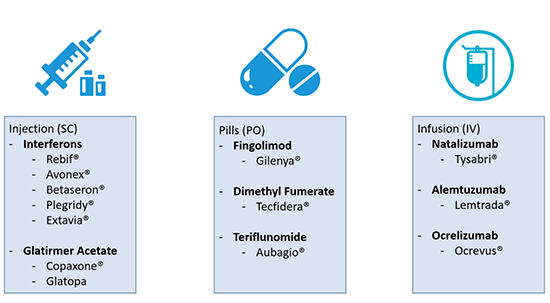 We don’t know…We need representation from everyone to better assess how effective these drugs are.” –Tirisham Gyang, M.D. Hoffman, a clinical immunologist who studies immune response, told the audience that the research that is going on right now has exploded over the past 10-15 years. In his specific research, they use a gene-therapy approach to try to “re-educate” the immune cells to stop attacking the myelin. They have been very successful in doing this in mice and have recently published a paper about their results. He stated excitement about the wide range of research that is currently taking place on MS, from stem cells to gut and mucosal immunities (which he described as “what you eat is what you are” research). Resources for persons affected by MS and healthcare providers. Sarah Kurtz provided information about the tools and resources available to patients, caregivers, and clinicians through the National MS Society. Kurtz explained that “MS Navigators” are “supportive care partners” who are available to help address the challenges of MS.
MS Navigators have access to a wide network of resources, from employment- and insurance-related issues to help with housing, financial assistance, or establishing care. There is a wide variety of groups so that people can find one with members they can relate to and learn what they did when faced with specific challenges or similar situations. There are groups for people with MS, their family, and their friends. Examples of these groups include MS Caregivers, Teens with MS, Moms with MS, and Kids with MS.
Kurtz stated that MS is changing all of the time and it is important to the National MS Society to provide continuing education activities year-round. MS providers, nurses, physical therapists, and other clinicians can access webinars, in-person CEUs, and networking calls on the Professional Resource Center. For those interested in pursuing a career in MS care, the National MS Society offers support. Kurtz said that some of the things they do are to sponsor MS fellows like Gyang and Amezcua and fund the research of scientists like Hoffman. They also have programs for PT students interested in neuro-care and for medical students to get them engaged early on in their training. Audience members asked questions related to the prevention of MS and panelists gave recommendations about vitamin D supplementation, diet, and how growing up in a tropical climate may be a protective factor. Please view the recorded livestream to hear their recommendations.